Tagged BRATs 2014, BRATs Langkawi 2014. It takes a lot to upstage a flock of super adorable penguins, but that’s exactly what the zookeepers of Underwater World Langkawi (UWL) did when the BRATs met them a couple of weeks ago. While the animals are obviously the main tourist attraction, it is the zookeepers who are the real stars of UWL. 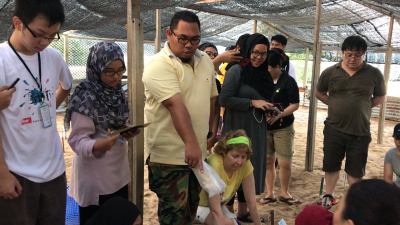 The incredibly dedicated animal lovers showed the BRATs all the hard work they do on a daily basis to keep the animals happy and healthy, so UWL can continue to inspire young Malaysians to conserve the environment. UWL assistant curator Azizah Mustaffa said: “It’s not easy being a zookeeper, because you have to be on-call all the time in case anything happens to the animals. Not that any of them are complaining. The zookeepers we spoke to were all quick to recognise just how lucky they were to do what they do for a living. 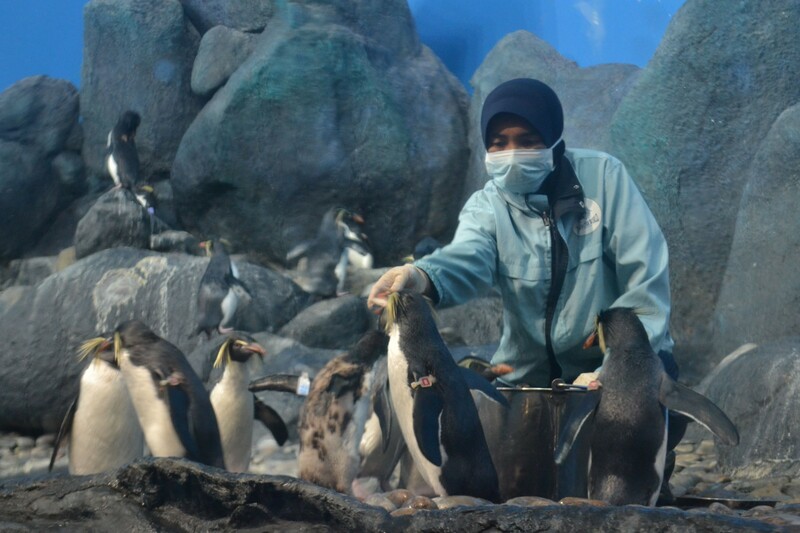 For the past two years, zookeeper Nur Maisara Ramli has been the proud caretaker of 24 rockhopper penguins at UWL. While that might sound like a lot of fun, it is actually a lot of work. Maisara has to be involved in every aspect of maintaining the penguins’ well-being, from feeding them to rigourously cleaning their enclosures every day. According to Maisarah, penguins are extremely sensitive creatures that require very specific living conditions. Any change in the environment could be detrimental to their health, which is why Maisara and her colleagues have to be on call 24 hours a day, and live in quarters right behind UWL. Their actual working hours are from 8am to 5pm, six days a week. 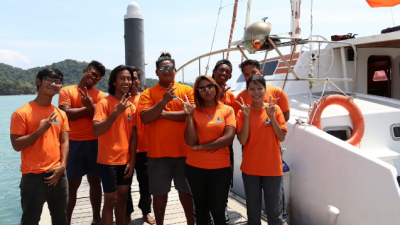 But for Maisara, being able to work with the rockhoppers makes it all worthwhile. “I don’t get many days off but that’s okay because I tend to miss them a lot whenever I’m on leave,” she said. At UWL, the penguins are labeled with tags and identified by their given numbers as there are just too many to keep track of. But Maisarah has given names to a few of them, including Penguin number 78. “I named her Aidil because she was born a few days after Aidilfitri,” she said. Maisara treats the penguins like her own children. To form closer bonds with them, she takes it upon herself to understand their different personalities. That was how she discovered Aidil’s love for pens.“Sometimes they’re really funny. They hop and they fall. They’re very exciting creatures, and they make me happy,” she added. Zookeeper Tan Gin Lui, 30, doesn’t have just one, but two pet seals. Okay, so they aren’t technically her seals – they belong to UWL – but the incredible bond between her and UWL’s southern fur seals Pao and Karen is clear for all to see. 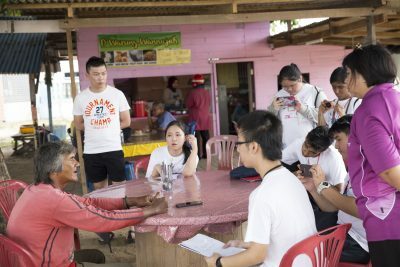 Tan invited several BRATs reporters to the seals’ quarantine area, where she conducted a quick medical examination, took some measurements and brushed their teeth. “Seals are very intelligent creatures, so we can train them to cooperate with us,” said Tan. Tan positively reinforces good behaviour not only by giving the seals some snacks (pieces of fish, naturally), but also by patting them on the head and speaking to them in a reassuring tone. “You have to be patient with them,” she said. The seals, in turn, appear to love her for it. They stopped several times during the examination to plant kisses on her face. “They’re very fishy kisses. You guys want a kiss too?” she asked the BRATs jokingly. Only one took up the offer. The aquatic biology graduate has been working with the seals since she joined UWL five years ago. The toughest part of the job, she said, is when an animal passes away. 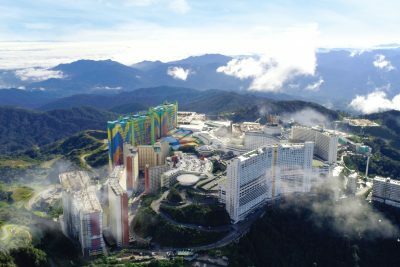 Despite the long hours and extreme dedication required to look after Pao and Karen, Tan readily admits that she has – in her mind – the best job in the world. Assistant animal keeper Muhammad Effendy’s job is to train and care for UWL’s rainforest creatures, including common marmosets and macaws. His responsibilities include flushing and cleaning the enclosures, feeding the animals, and even conducting post mortems on any animals that die. “There are a lot of arrangements that have to be made for the animals. We have to plan many steps in advance, especially when it comes to their training,” said the 24-year-old, adding that the best moment in his career was when he trained a macaw to say “hello”. Despite working with so many different animals, Effendy’s favourite by far is the common marmoset, a small monkey species originating from Brazil. “Working with the common marmosets has helped me build a stronger character,” said Effendy, who hails from Taiping, Perak. Iszuddin Idris, 24, has dedicated his life to caring for the African penguins at UWL. Though slightly less prone to sickness compared to the rockhopper penguins, Iszuddin’s birds nevertheless require meticulous care. When the BRATs visited the penguins, we were first required to sterilise the soles of our shoes in a special solution in the working area outside the enclosure. After that, we still had to change into boots before we stepped inside. We were told the penguins get “stressed” when they encounter strangers, so the BRATs were only allowed into their enclosures two at a time. Even then, they hopped away every time we tried to get near them. It took around 10-15 minutes for them to get used to us, and after that, we were able to get close enough to pat them on the head. Iszuddin even allowed us to carry one for a bit! 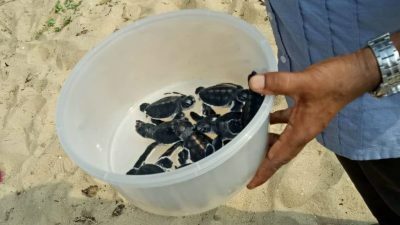 “It is such a beautiful job as I am able to witness the life cycle of the penguins; from the eggs hatching to the chicks growing up and finding their own partners,” said Iszuddin, who worked at Aquaria KLCC before moving to UWL to gain new experiences. Iszuddin’s work includes a fair bit of manual labour, as he has to scrub down every inch of the enclosure on a daily basis. He added that he feels “emotionally attached” to the penguins. “They are not only intelligent, but they all have distinct personalities. 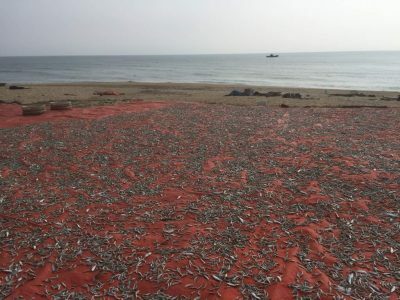 I can recognise them solely based on their behavior,” he said. A few of the BRATs were lucky enough to get to try feeding the penguins and washing the enclosure; and though it was an amazing experience, it sure wasn’t easy. 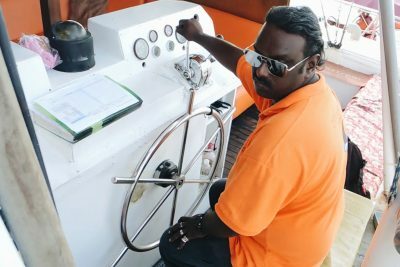 Nevertheless, Iszuddin enjoys his work very much and is completely dedicated to taking care of the penguins. 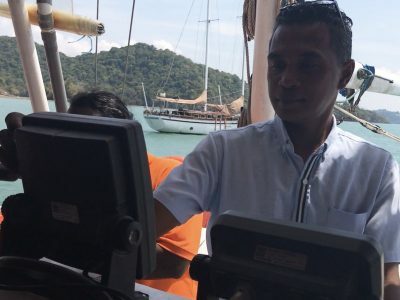 As you can imagine, there are quite a lot of people with interesting jobs at Underwater World Langkawi. But Halijah Tayib, 52, probably takes the prize for most unlikely job – she is, essentially, a chef to the animals. Halijah is a feeder for UWL’s rainforest section. She prepares and feeds the various animals in her section, which includes birds, fish, reptiles and, of course, the common marmosets. Despite her age, Halijah dutifully climbs around slippery enclosures to make sure the animals get the nutrition they need to stay healthy. And she does this even though she has health issues of her own. 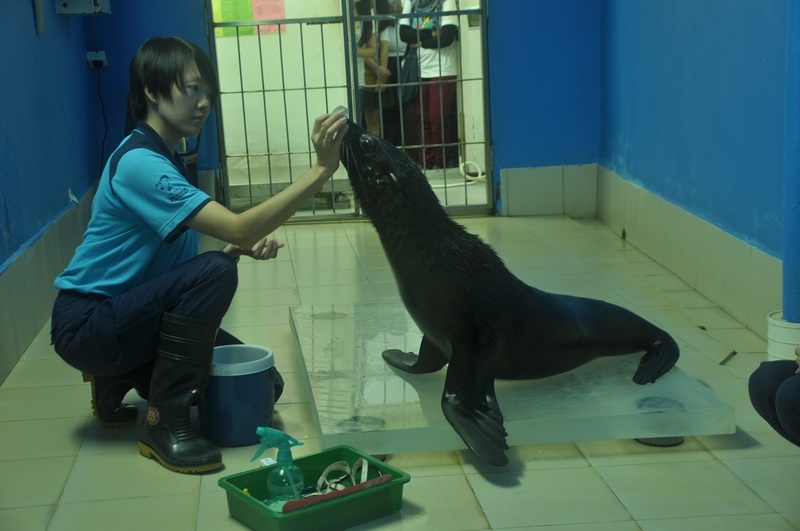 Despite working at Underwater World Langkawi for only a year, her bond with the animals is obvious. She cares deeply for them, like they are her own children. Chin, a blue-and-gold macaw living in the Rainforest section, is the perfect example. Chin is a slightly aggressive bird, but that behaviour completely vanishes when Halijah is around. Halijah coos to him, and he responds with the same amount of enthusiasm and affection. 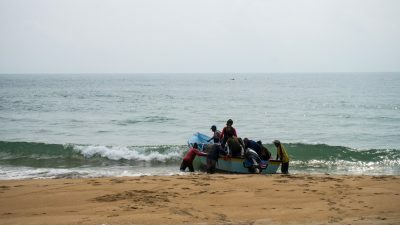 DID you know that the first solar-powered boat in Malaysia was mostly built by local university students? 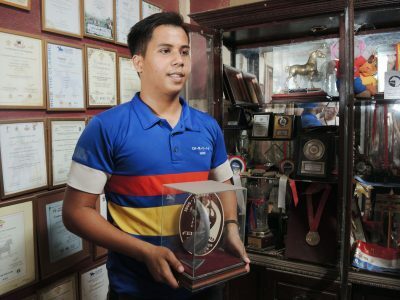 A FEAR of heights might have ended Muhammad Ziyad Muhammad Hamzah’s horse riding career before it even started, but growing up in a family of professional endurance horse trainers gave him the motivation to continue. ABU Ubaidah Muhammad Hamzah is a showman on a horse. 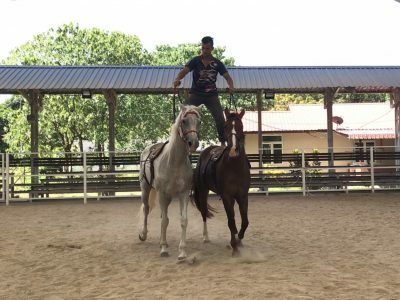 The 24-year-old specialises in trick riding, a special equestrian field that combines athletics, acrobatics and horse riding.